Designed to accompany Clinical Practice of the Dental Hygienist, 12e, this unique active learning workbook reinforces the important concepts of the main text and provides hands-on practice in putting those concepts into practice. 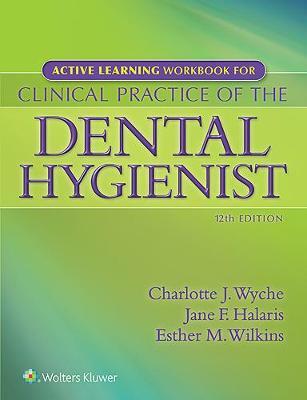 Each chapter provides an array of engaging skill builders to help students master the assessment, planning, treatment, communication, and documentation skills they need to succeed as dental hygienists. Reflecting the changes in the main text, the 12th Edition is enhanced by a new user-friendly two-color design, an increased emphasis on critical thinking skills, and a stronger focus on helping students make the transition from the classroom to practice. - A new title, "Active Learning Workbook," emphasizes the books focus on preparing students to make the transition from learning to practice. - A new 2-color design makes the book easier to use. - New Medical Subject Heading (MeSH) term boxes help students cpnduct effective and efficient PubMed literature searches. - Revised crossword and word search puzzles increase student mastery. Halmark Features: - Everyday Ethics boxes include individual learning, cooperative learning, or discovery activities that challenge them to resolve the types of real ethical dilemmas they will face as practicing dental hygienists. - Competency Questions ask students to apply their knowledge in analyzing assessment data, creating care plans, and documenting patient care. - Medical Subject Heading (MeSH) term boxes help students conduct effective, efficient PubMed literature searches. - Knowledge exercises require students to define key terms, concepts, and principles and to answer questions based on text information. - Crossword Puzzles and Word Searches reinforce terminology in a fun, interactive way. - Discovery Activities build skills by asking students to find and analyze professional sources of current, evidence-based information. - Questions Patients Askexercises require students to use their evidence-based decision-making skills to address patient concerns. - Factors to Teach the Patient show students how to develop conversations with patients using motivational interviewing techniques. - For Your Portfolio suggestions encourage readers to reflect on their growth as a dental hygiene professional by developing a portfolio that highlights individual talents, special skills, and competencies, resulting in an ideal tool for employment interviews or graduate education applications. - Learning Objectives highlight key information in each chapter.